I don't care much about basketball, but mulch is always on my mind - especially as the garden gets going starting in March. I like using Whitney Farms Weed Whompin' Mulch (aka Bark Mulch) for the non-food growing areas of our urban farmstead and around the berry bushes and fruit trees. But, I still haven't really found something I like for around the vegetable plants once they get going. So, I'm looking for recommendations. What's your favorite mulch for your food gardens? Do you use straw, bark, grass clippings, leaves? Or something else? Mushroom compost and lots of it. Bought a bale of straw last spring to put on the beds for summer (we live in Phoenix). It REALLY made a difference in moisture retention. At the end of the season I raked most of it off and threw it in the compost bins. I know it takes longer to cook but I"m a lazy composter so i don't mind waiting. I'd do it again but wouldn't mind trying something that could stay on the beds and break down where it lies (lay?). Say some sort of manure, maybe grass clippings. LOVE the blog! We like corrugated boxes (remove tape and plastic labels) covered by, out of season, barn bedding (chicken manure); in season, clean straw and/or grass clippings. We've been known to mow a neighbor's place (no pesticides were used there) just to have the clippings. All this may change if the Saudis have a revolution, though. Might resort to spreading comfrey roots all over the acre; they're easy to scythe. I use cardboard in the walkways and the beds get straw. If you life in a really wet area, beware of slugs. In that case, mulch would be detrimental. I use leaves I collected and chopped with my lawn mower in autumn and stored for spring. I also use grass clippings and straw (from two bales used to cover my strawberries each year) even if the former has to be renewed often because it breaks down. I use straw and then dig it in at the end of the season. I cardboard mulch every growing space I have and then cover it with a thick layer of whatever we've got. This year we convinced the tree guys down the road to dump their load of wood chips in our yard plus we've collected 4 or 5 pick up truck loads of bagged leaves people put out for the trash. We also get rice hulls from down the road and occasionally buy a round bale of straw (we haven't had to do that in a few years). The key is to make sure the cardboard or paper is well overlapped and thick and that the mulch layer on top is sufficiently thick to hold it all down. After a few seasons of cardboard and leaves composting on my garden beds I don't even have to re-cardboard because all the weed seeds are buried under 6 inches of compost. I just add more mulch to the top - normally as much as the bed will hold. I use a mix of compost and straw. And I just deal with the inevitable weed seeds that come with the straw. Deal with usually means pulling up by hand the first flush, when they are small and easy. I usually ignore later waves as they are less likely to get big enough to matter. fresh homemade vegan gorgeous organic black gold: COMPOST OF COURSE! My neighbor works for a tree company. If I need any organic mulch (tree branch clippings, leaves etc) I just ask him and they deliver it. Its completely free. 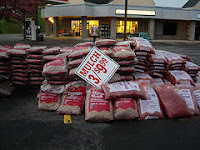 Most places want you to take their mulch. If people don't take it then its delivered to parks n such for paths. I spread this stuff around all my property. I really like straw for my veg and fruit but the flowers and other "prettier" areas get a top-up of wood mulch that our city makes out of trees and branches that they trim and chip. I also like cardnoard. Hsve experimented with shredded newsprint. I use cardboard covered with last season's leaves. I snag bags and bags of leaves from around the neighborhood to feed the compost pile and cover the garden. I always use several layers of newspaper(not the shiny stuff, just the black and white) with a good layer of straw on top. The city recycle yard here gives away free bark chip mulch, which I use in pathways and perennial beds. If I overwater my food beds (which I do because I don't have my irrigation game down) the pathways start composting nicely and I can shovel the chips in the fall onto the beds for a top mulch all winter. I've tried straw, the seeds are annoying but can be pulled early easily. We have a mushroom farm on the south end of town that sells a cubic yard or so of compost for $25 each spring, limit one load. I'm considering wearing groucho marx glasses and repainting my trailer so I can get two loads this year. I do have a couple of compost piles going in the yard, but I'm not on my composting game either, so the output isn't sufficient for the 1200 or so s/f of beds I have. My gardening group has hooked up with a local home-brew society and we should each be getting some 5 gal buckets of spent grain that will go in the home compost pile as well. I did pick up coffee grounds from local coffee shops a couple times last year and I should check into that again this season. I put the grounds straight onto my broccoli bed as a moisture retaining mulch and the brocc went crazy last year, but that could have been the favorable weather as much as anything. The local nursery has a fine bark mulch blend that works well around small seedlings, but it was pretty expensive and I'm all about free these days. I use alfalfa. It's cheap and easy to lay down, doesn't have the seed problems of hay, and has more nutrients for building up the soil as it decomposes.